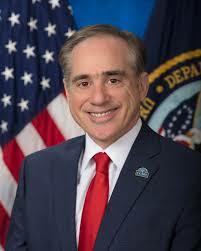 VA Secretary David Shulkin, M.D. 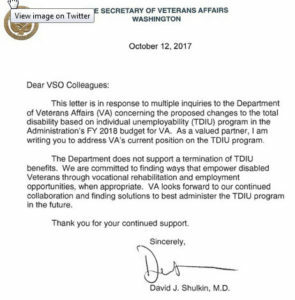 David Shulkin, the U.S. Secretary of Veterans Affairs, issued a letter on October 12, 2017 advising veterans service organizations that VA now opposes eliminating Individual Unemployability benefits for veterans over 60 years old. Despite a proposal when the Trump Administration’s budget was first floated this year that would have eliminated Unemployability – also called Total Disability based on Individual Unemployability, or TDIU – for seniors, the Secretary is trying to assure veterans groups that the administration no longer wants to take away Unemployability benefits from the most disabled and helpless of all veterans. Veterans should beware next year and years after for attempts to cut Individual Unemployability benefits for vulnerable senior citizens who can least afford a decrease in their benefits. To learn more about VA Individual Unemployability / TDIU benefits, visit John Tucker’s TDIU Library. If your claim for VA Individual Unemployability benefits was denied, call an experienced veterans attorney at (866) 282-5260 or contact a veterans disability attorney online to discuss your rights to appeal and received TDIU.